That is excellent, is this the first working part going into a RepRap? I think it's the first Darwin-specific part. 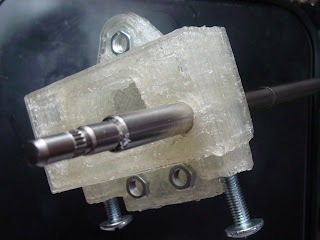 We've made an extruder before, and Zaphod had a couple of self-fabricated clamps in it. I've added the X idler pulley to the assembly now, BTW. "In the previous post, you can see the part starting to curl like a king-size mattress being stuffed into a queen-size fitted sheet." Yup, that happens with HDPE, too. The trick is to design parts with critical surfaces on the top side of the print and holes as far away from bottom corners as possible.